Seven days in to my vacation and I ran out of time. Its 1AM in France and I lost a 194 day streak of daily French studies online. I lost time to blog here about my travels other than by cheating and copying my daily Facebook post. And I failed to get a Reader Column in. It’s late and I have to wake early to plug a meter. I think I’ll just take the fine. Here’s what I put in Facebook. I am watching the BBC showing minute by minute video of cell phone video of 9-11. 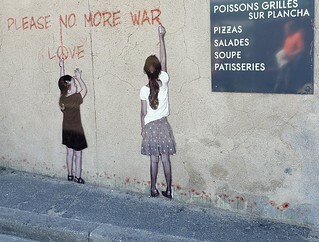 The anniversary wasn’t our mission when we left for St. Malo early this morning. We had two stops on our itinerary. The first was Bayeux to see its Cathedral and the football field length tapestry celebrating the invasion of England by William the Conquerer. Fascinating and gorgeous. Then we headed to the gravesite of 9,000 Americans who gave their lives to invade France and stop tyranny. To think that we have elected a President so chummy with dictators. 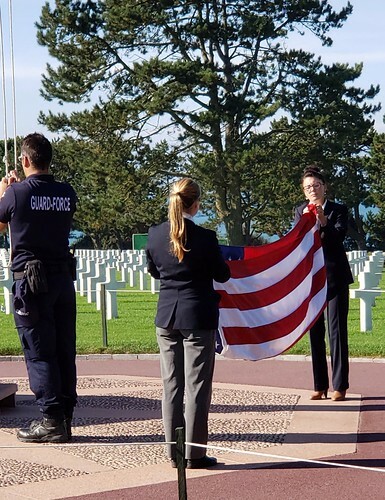 At the Normandy cemetary we saw the French lower our flag at afternoon’s end and replace it only to give the lowered flag to one of the fallen’s loved ones. Deadly Omaha beach, where so much blood was shed, was at a beautiful low tide under an intense sun below the graveyard. The ranks of orderly headstones above were every bit as beautiful as the sights in Bayeux. We got in late to St. Malo. The day’s sobering moments on pause we had a giddy experience driving the tightest streets in France to get to our hotel. Our late dinner was charming with a surprise table guest. Now its back to New York and the horror of the new millennia.